The iPod family of audio and video players is steadily conquering the market of portable consumer electronics. From the tiny Shuffle to the multimedia-packed iPod Video, these players top the most wanted gift lists around the world. Whether you are a newcomer to the iPod world or its loyal fan, it is obvious that you want to use your player to the maximum of its capabilities: upload highest quality audio, video and image files in a quick and efficient manner, enjoy them yourself and share them with your friends and family. Unfortunately, iPod Video only supports its own generic format of video content. Therefore, users who wish to transfer their movie collections to their brand-new iPod Video face a hard choice of the right video converter. If you have similar concerns, stop losing time and look no further - iPod Video Converter has everything you need to convert major video formats to the iPod format in just a few easy steps! 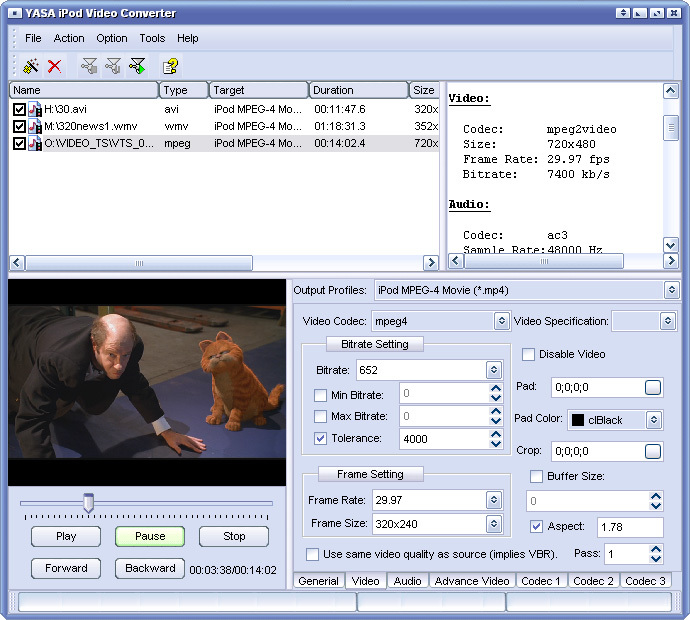 With iPod Video Converter, you can convert almost all major video formats, such as DivX, XviD, MOV, RM, rmvb, MPEG, VOB, DVD, WMV, AVI to iPod Movie / iPod Video format. Boasting support of a great number of popular video formats, iPod Video Converter also features great conversion speeds and a user-friendly intuitive interface saving you the trouble of fine-tuning the program before every conversion. To convert AVI to iPod, for instance, just drag and drop the files you want to have on your favorite player and start the conversion. Your iPod movie will be ready soon and will be fully compatible with the device. No need to worry whether you specified the right settings - let iPod Video Converter will take care of it! Simply put, iPod Video Converter is the next best thing after your iPod. Simple, compact, affordable, yet fast and versatile, this great tool will truly turn your iPod Video into iPod Movie. With iPod Video Converter, your personal pocket movie theater is just a few clicks away, so give it a try right now!